I’m not sure if too many know about my little Parker. 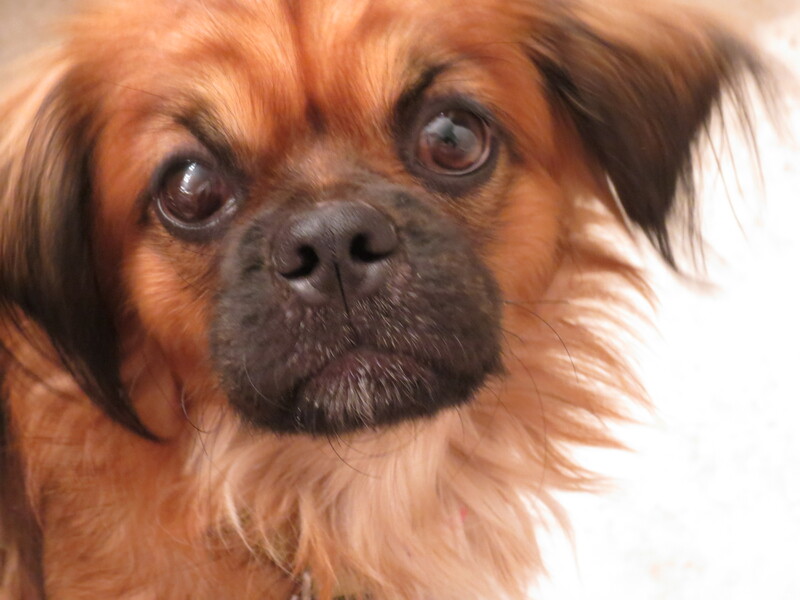 Parker is a small pug/pekingese dog. He is about a year old and just the cutest little dog with a very sweet personality. He is also a very smart and doesn’t give up on doing what he wants to do. Let me explain why I say this. Doggie Door: Yeah, Parker has defeated our doggie door. Usually the doggie door does great so our dogs can go out and do their things without us having to open the door every 5 minutes. It is great until we have to close the inside door and leave the dogs outside because company is at the house or we have to go somewhere. That’s when this 20 pound little dog goes into high gear to seek and destroy the doggie door. And that’s exactly what he did. Within 30 minutes with the first doggie door flap it proved to be not much of a determent to him. He started from the bottom and tore his way all the way up and within minutes the door had holes and such in it. We had to duck tape the bottom until we could buy a new flap. 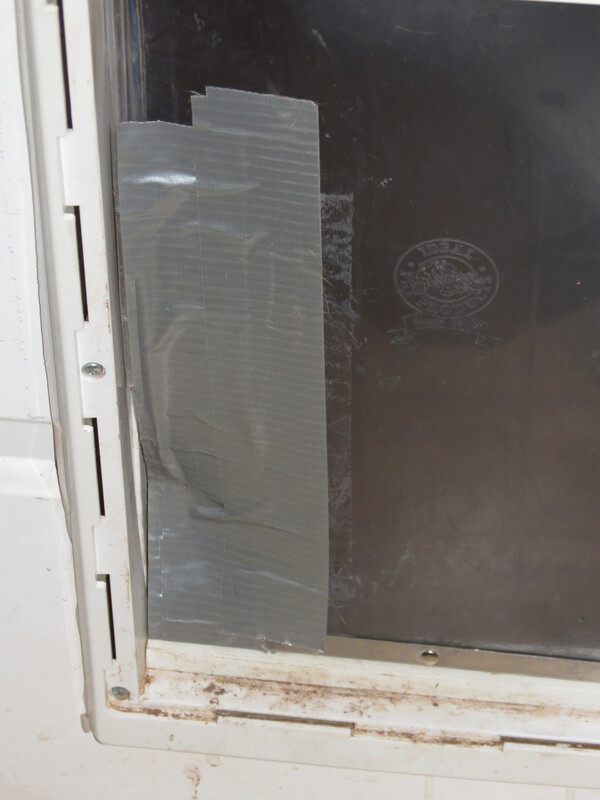 I leave the house thinking that Duck Tape works for everything. That is what they say right? Well, it doesn’t work if you are using it on a doggie door that a little determined dog decides doesn’t need to be there. So in the house he runs with Duck Tape on his feet and he lifted the locked door for the inside of the door that is suppose to keep unwanted animals or pets out. Yeah! OK! We went and got a new doggie door flat and decided this time to block the door when we are gone with cinder blocks. He was able to move those out of the way and make his way to the newly installed and now full of holes doggie door flap. I must say that Parker is not a stupid dog. 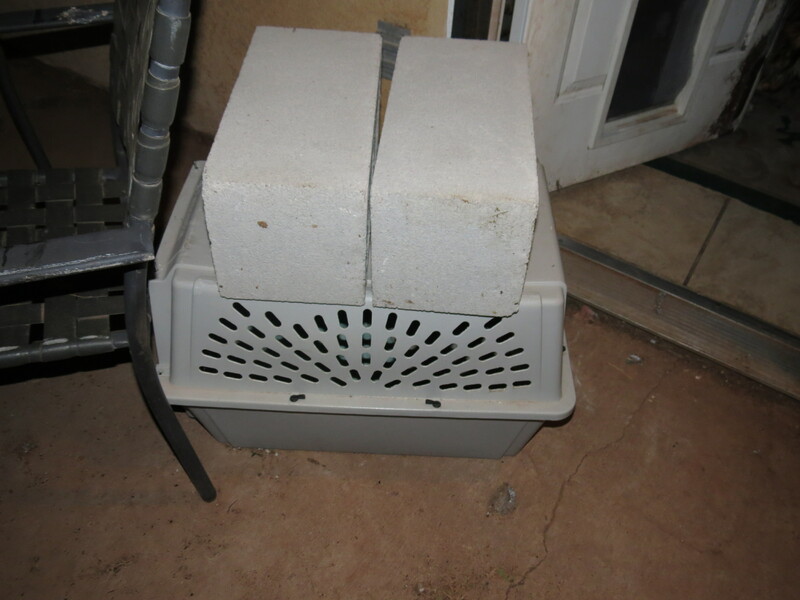 Hubby decides that it might work if we put two cinder blocks on top of a solid dog crate. We moved this make shift thing in front of the door on the outside so he can’t squeeze in and move it. That did work a bit better, and he was still outside. Then tonight in all my brilliance I was thinking that maybe he doesn’t like to be outside and I decided to put him in the dog crate that he sleeps in at night. It is made for a Husky, so there is plenty of room in there. All my dogs can fit in there together and still be comfy. I leave for a SHORT time to see how it will work. If I was gone longer, I would have been in trouble. I walk in the house and look around. 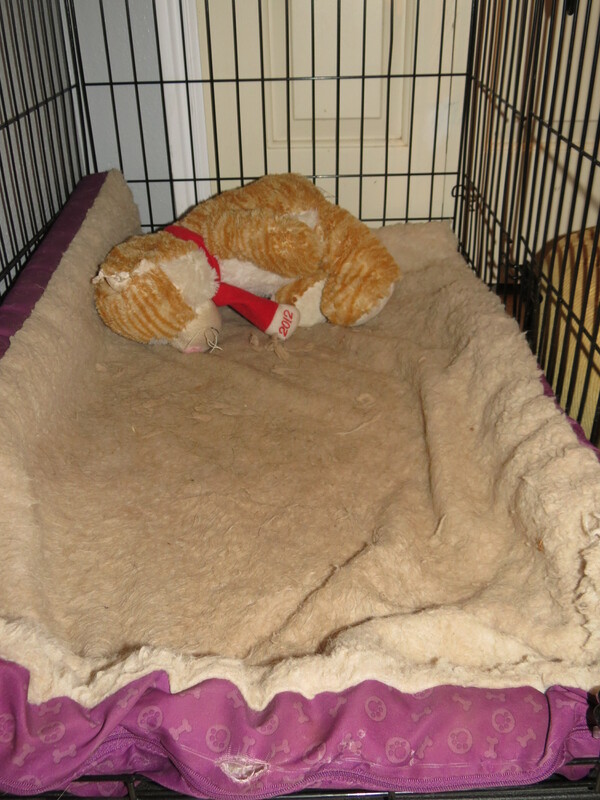 And low and behold here is Parker still in his dog crate. Yeah, he is there, but at the same time, it is turned upside down with the bottom tray in the middle of the room. His mouth is around the metal latch ready for the break out. I told him he was a bad dog and he wagged his tail and he gave me this look that was so cute. How can I punish him when he looks like he is smiling at me. Now, I have to devise another plan in my brain to see how I can outwit this little dog that seems to be able to get out of his crate and from eating the doggie flaps on the doggie door. This is the dog crate we have for Parker. I had to straighten it out and then I notice he put a whole in his mattress… Goofy dog.